CSAG engaged in this year-long project with the Malawi Department for Climate Change and Meteorological Services (DCCMS). The primary objective of CSAG’s involvement in this project was to develop and support training and capacity development within DCCMS with the goal of enhancing DCCMS’s production and delivery of climate information to end users. To meet this objective, CSAG worked with key personnel in DCCMS to address key issues related to existing infrastructure, skills, methods and tools. The first engagement in the project involved a number of DCCMS staff attending a two week Winter School hosted by CSAG in Cape Town. A two day inception meeting in Blantyre, Malawi, then brought together DCCMS staff to discuss the needs and desires of DCCMS and the user community in Malawi regarding the provision of climate services. 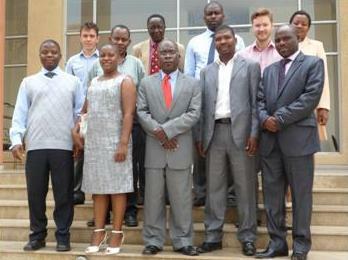 A vital part of the project was the “training of trainers” workshop that took place in Blantyre in November 2012. DCCMS nominated ten members of staff to attend the week-long workshop; these people were then responsible for facilitating subsequent training throughout the rest of the organisation.